Julie Ferwerda's website | Are You Following The Pilot Car? One of the great benefits of living where I do is the close proximity to the mountains. Driving only a couple miles, we’re in a beautiful rugged mountain canyon with recreational possibilities galore. 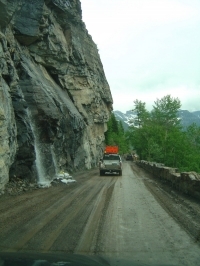 The road through the canyon eventually comes to the landing of a steep switchback road that takes you for miles and miles into the mountains where you will find lakes, hiking trails, glaciers, camping, fishing, wildlife, and a great population of rather large, hungry mosquitoes. This past summer, Shucks and I decided to take this mountain road (called “the loop”) to visit a certain lake on top where we knew we could wrestle some bears for end-of-season wild raspberries. When we got to the landing of the switchback at the bottom of the vast mountain range, we were suddenly reminded of the big road paving construction project when we encountered a flagger. After waiting for a few minutes we were then escorted by a pilot car for a few miles up the steep switchback road. We followed the pilot car up and up, getting a better vantage point of the valley below at each switchback until finally, we came to the top. At this point, it was so tempting to stop so we could look over miles and miles of open space below—we felt as if we were at the top of the world. But we couldn’t do this because we were following the pilot car and it was necessary to stay on track in order to get through the rest of the construction on the way to our destination. Not only that, the yummy raspberries and hungry bears awaited several more miles down the road! This year more than ever, I have learned that the pursuit of truth is a lot like ascending into a mountain range behind a pilot car. It is a work in progress, leading to many intriguing, breathtaking, uncharted locations while following the Holy Spirit. The discoveries, panoramas, and adventures that lay before us as we study God’s Word are more endless than exploring the Andes-the world’s longest mountain range. But only if we keep on the move, following the pilot in front of us! The problem I see now is that for most believers, denominations, churches, and even theologians, we get started up the switchbacks and at each vantage point and tend to think we’ve arrived. So we stop. Maybe we take some pictures, have a little lunch, then sometimes even head home instead of forging ahead. Maybe we even get to the top of the switchbacks where we feel like we’re at the very top of the viewpoint. Why keep going further we wonder as we stare off into the valley below, forgetting that there are still majestic glaciers behind us unexplored. Most of us don’t want to seem flaky in our theology, so it feels safer to assume we’ve arrived at a good enough destination. Or maybe we just leave it up to the pastor, assuming that if his theology is good enough for him, it’s good enough for you. But I’m learning that much of what we camp on is really just part of the story—often times a very small part or even an incomplete part! And as soon as we stop pursuing the whole picture, we land in the middle of error. I can say that over this past year, I have dared to continue on with the pilot car, zigzagging deeper into the mysteries of the mountains, allowing myself to question, “WHY do I believe what I do? Is this the whole picture or did I stop too soon?” And it is not surprising that I have discovered many new perspectives and delights by continuing the journey from where I had stopped in the “traditions of men.” Really, so many of our beliefs in the Church are nothing more than stifling traditions, which is why they answer so few of the questions we have out of the pages our Bibles. In 2010, I dare you to get back behind the pilot car to go where statistically few have gone before. I will soon begin posting Bible commentary for each book of the Bible from my own mountain expeditions this year. God is so unlimited and beyond ever fully knowing, a full revelation of His truths are a definite journey, not a destination. C’mon…there is much territory to be discovered ahead. Let’s get going! I believe that may be a captivating element, it made me think a bit. Thanks for sparking my thinking cap. Once in a while I get such a lot in a rut that I simply really feel like a record. Now you’ve your new website and also you’re eager to begin making some sales! But, how are you going to make gross sales in the event you don’t have high volumes of visitors to your web site? Thanks for your excellent post. Another problem is that being a photographer requires not only problem in capturing award-winning photographs but additionally hardships in acquiring the best bridge camera suited to your needs and especially problems in maintaining the quality of your camera. This really is very good and visible for those professional photographers that are into capturing the natures scenes – mountains, forests, wild or maybe the sea. Visiting these fantastic locations certainly needs a camera that can surpass the wilds unpleasant area. By my notice, shopping for electronics online can for sure be expensive, but there are some principles that you can use to acquire the best deals. There are usually ways to find discount bargains that could help to make one to come across the best technology products at the smallest prices. Thanks for your blog post. Very often times this area is overlooked. So kudos to you. Thanks so much for posting this great info! Looking forward to seeintg more. I love you’r web blog template, which template do you have?? please reply! Enter into the planking contest for absolutely free and also get paid to plank. Simply get as many pals as feasible to vote on your planking contest entry in order to win.